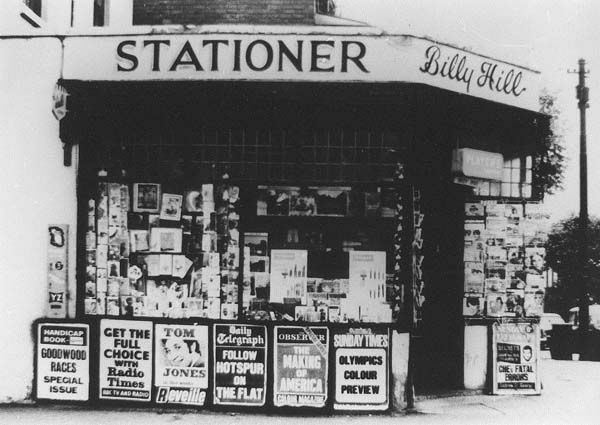 Billy Hill's newsagents in 1964. The shop was situated at the junction of Willoughby Street and Derby Road. An undated photograph of Willoughby Street probably taken in the late 1950s. The photographer was standing at the Derby Road end with his/her back to Derby Road. 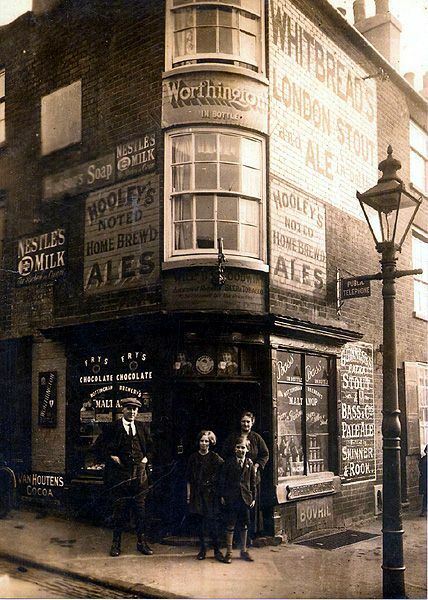 Having previously been out in South Africa William Henry Samuel and Ada Anne Goodwin came to live in Nottingham about 1920 and subsequently bought this beer-off (No.15 Willoughby Street) located at the corner of Willoughby Street and Newgate Street. This photograph taken after they had moved in shows Mr and Mrs Goodwin with their two children, Nellie and William Henry (known by the family as Sonnie) outside the beer-off. 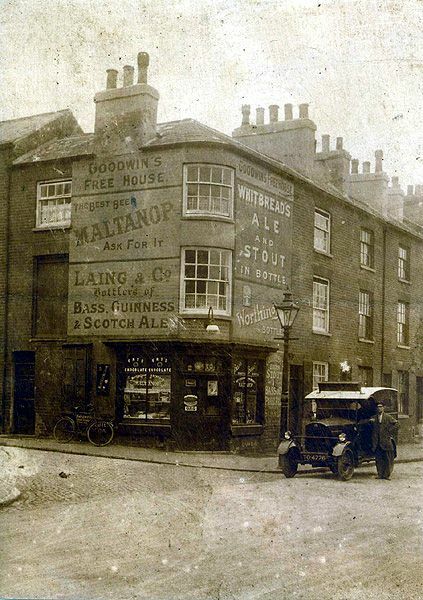 The same beer-off as in the previous photograph but the sign writers have subsequently been busy updating the 'advertising material' painted on the walls of the building and it now clearly indicates that the Goodwins are the current proprietors of the business. The photograph was probably taken about 1924. The Goodwins continued to run the beer-off until 1933. The Boys Brigade Club in May 1930. 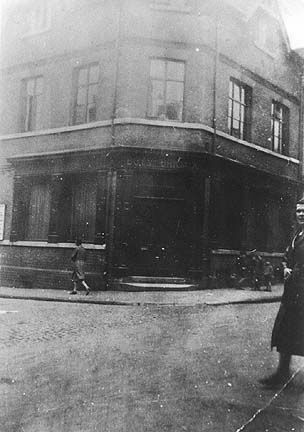 The building situated at the corner of Church Street and Willoughby Street later became the base for the Monty Hind Boys Club. This is the stretch of Willoughby Street between Park Road and Castle Boulevard. 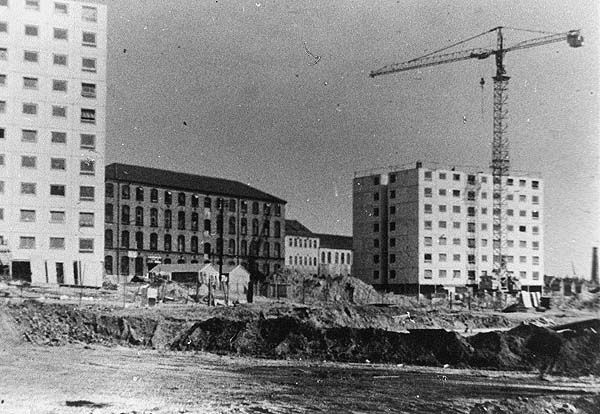 The property on the left is still with us but the factory on the right burnt down in the 1980s and the property was subsequently demolished to make way for the M.F.I. furniture warehouse. 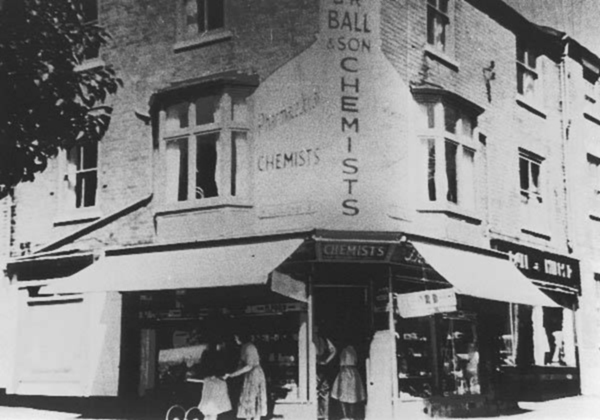 Ball's the chemist stood at the adjacent corner of Park Road and Willoughby Street. This business was transferred to a shop further up Park Road before the property came down in the general clearance of the area in the 1960s. 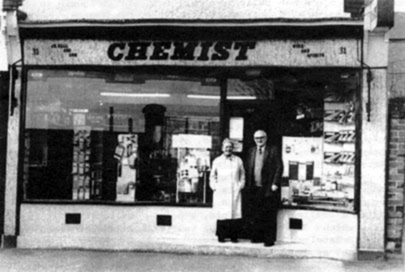 This is a photograph of the Ball's new shop on Park Road with Fred and Vera Ball standing in the door way. Photograph taken in 1982. Willoughby Street at its junction with Castle Boulevard. 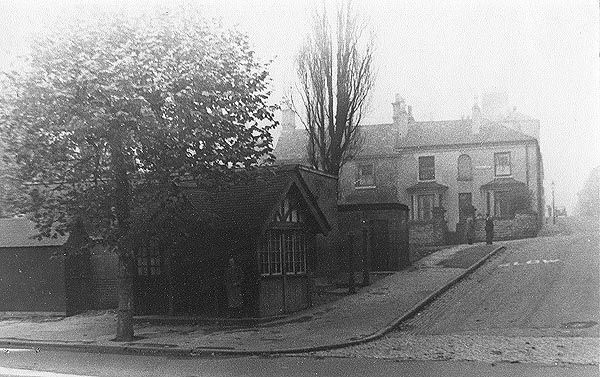 In the foreground is the old tramshelter and in the background some of the properties which stood on Sherwin Road. 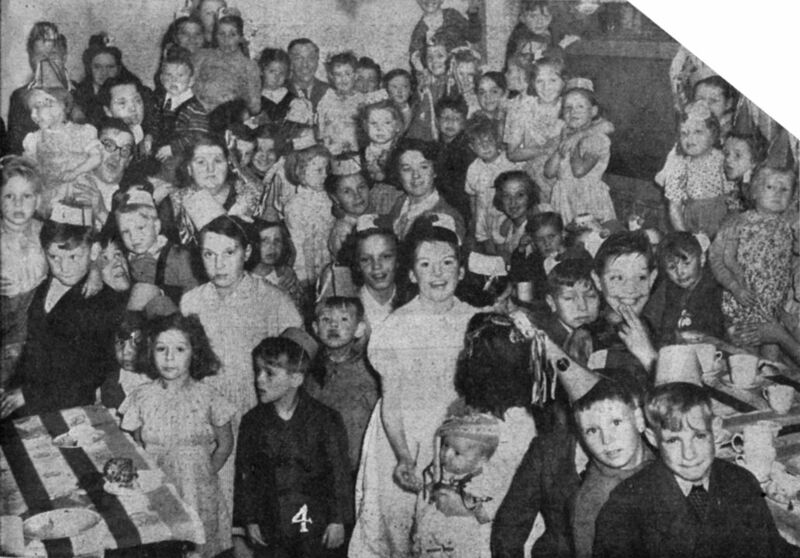 This photograph of a Coronation Day party involving residents of the Willoughby Street area appeared in the Nottinghamshire Guardian on 6th June 1953. At present we don't have any names. If anyone does recognise people in the photograph let us know and we'll create a 'key' photograph to go with the large version which allows us to pinpoint specific individuals. Newspaper 'photograph' courtesy of Glenys Randle. Courtesy of Ebay we recently  acquired a customer's payment card belonging to George Allison of 58 Willoughby St, Lenton. As the payment card reveals Mr Allison had acquired a new Ferranti Parva AC/DC radio from E. Neal (Cycle & Wireless Dealer) of 30 Willoughby Street, New Lenton. If you click on the photograph you can learn what we have uncovered about the Allison family, the cycle and wireless dealer, not to mention the radio itself. This portion of Willoughby Street stood near the junction with Derby Road. Halfway along the terrace is a passageway leading to other properties situated at the back. The sign above the passageway reads 'Bell's Yard'. This is the same set of properties but viewed from the other direction. 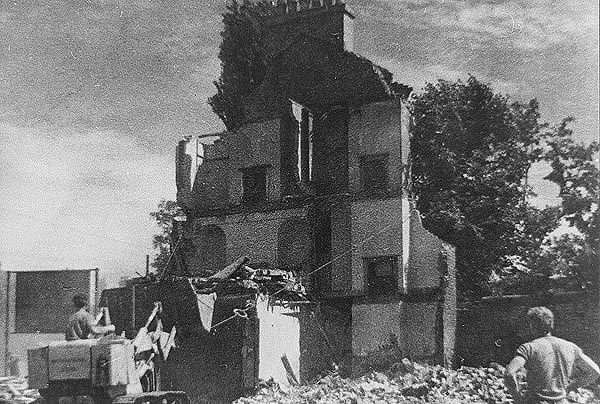 Demolition has now got underway and the date given for this and the next photograph is May 1962. 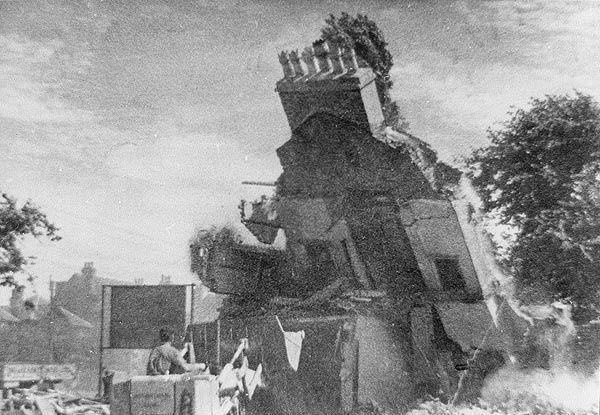 Probably taken later that same day the next portion of the terrace comes tumbling down. This sequence of four photographs shows a set of properties fronting on to Derby Road in the process of being demolished. A present day viewer can get some idea of where these properties stood from the presence of the Derby Road Methodist Church properties just visible on the left of the photograph. 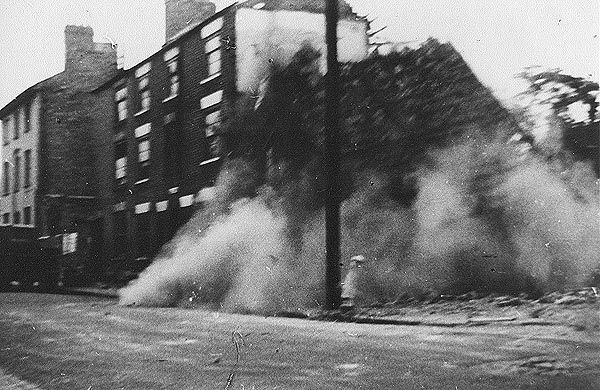 This photograph provides evidence as to how the demolition men went about their business. 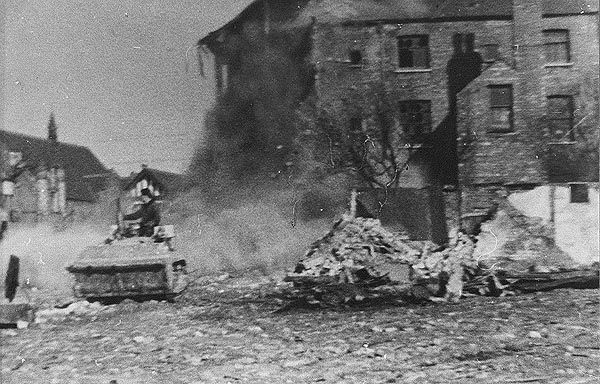 A chain attached to the mini-bulldozer is wrapped around the building and then the driver simply puts the vehicle into reverse. Seconds later the final portion of the buildings hits the ground. 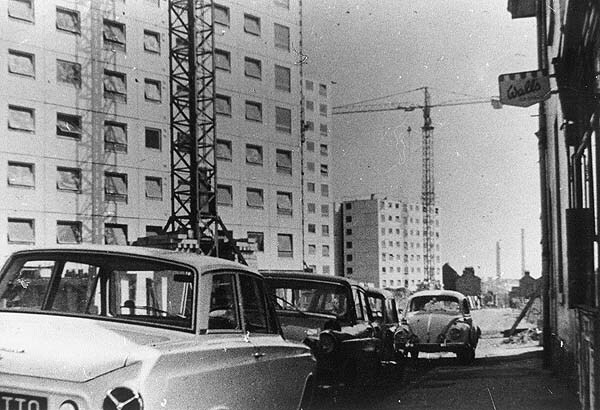 The date given for this sequence of photographs is May 1963. 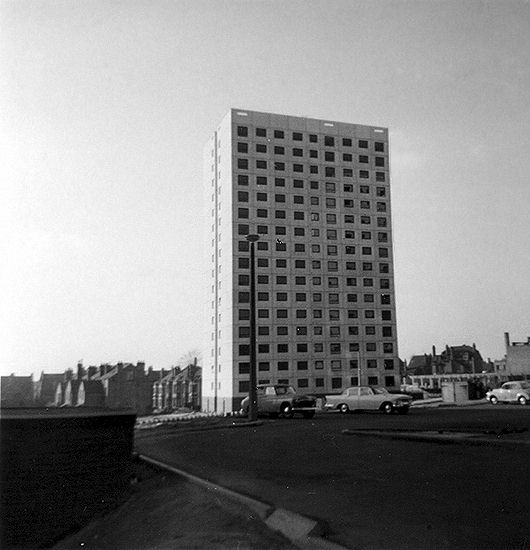 The Willoughby Street flats undergoing construction with Billy Hill's shop just visible on the right. 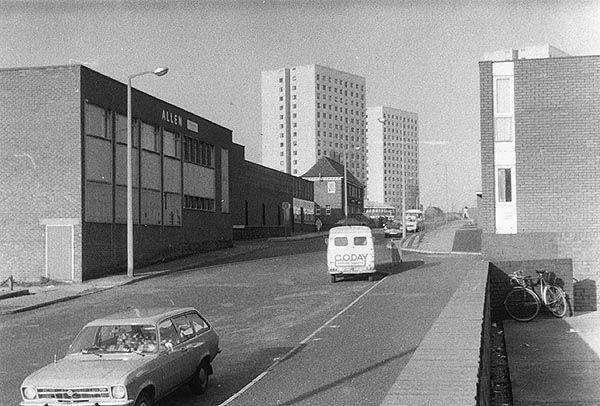 Another view of the flats with the Daks Simpson factory situated behind them on Park Street. 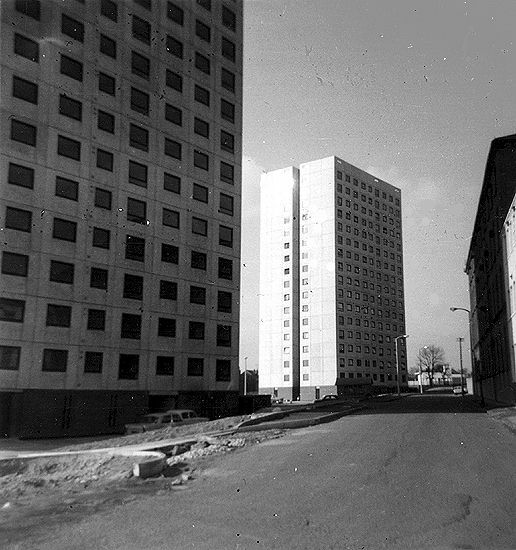 The three photographs above were supplied by Gordon Jackson and show the recently completed and still unoccupied Willoughby Street flats in 1965. 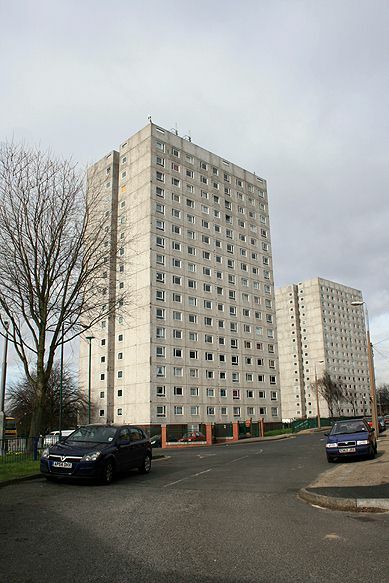 The Willoughby Street flats in 2008 viewed from Church Street. 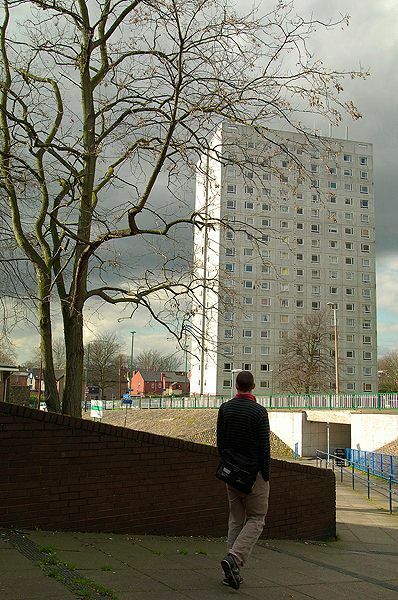 In the opening sequence of the 2007 film Control we are led to believe we are in Macclesfield but those familiar with Lenton would have recognised the presence of the Willoughby Street flats in this bit of the film. 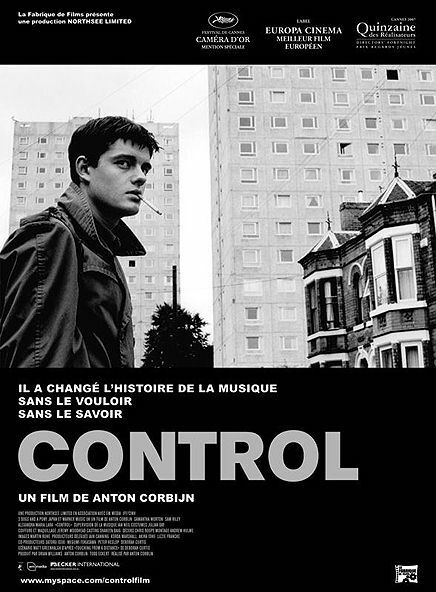 They also crop in this poster for the film made for the French market where the actor Sam Riley who plays Ian Curtis stands on Willoughby Avenue with the flats clearly visible in the background. 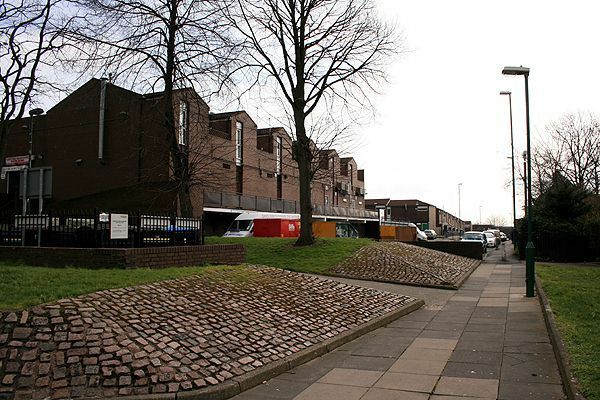 A 2008 view of the Willoughby Street flats from the end of Park Street as the road goes into the parking area at the back of the Church Square shopping complex. Part of the pedestrian pathway that takes you on to the extant section of Willoughby Street. The back of the Church Square shopping complex can be seen in the middle distance. Photograph taken in 2009 looking back along Willoughby Street with the junction with Prospect Place off to the left. 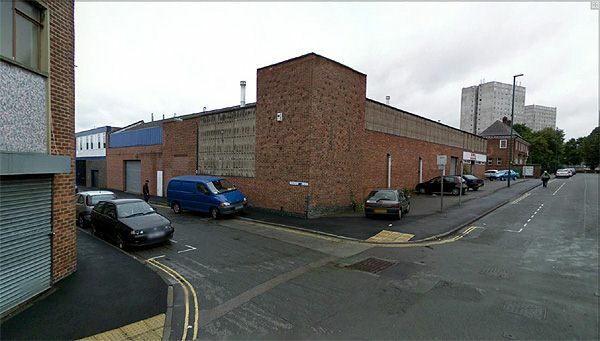 The industrial unit facing on to Willoughby Street for a number of years housed Manor Engineering. Beyond it the Lenton Centre and the Willoughby Street tower blocks are just visible. 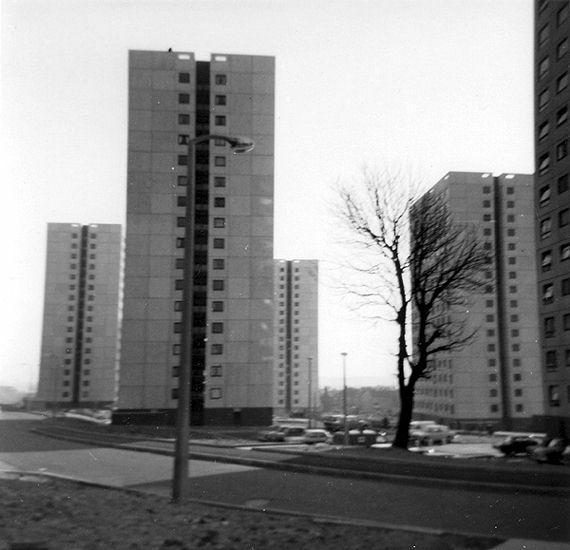 While studying photography at Nottingham Trent University Joe McCarthy took a series of photographs of the Willoughby Street flats. 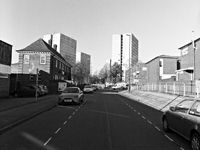 This one shows the view of Willoughby Street looking northwards towards the tower blocks in late 2010. To see more of Joe's Lenton photograph's on his Flickr gallery click here. 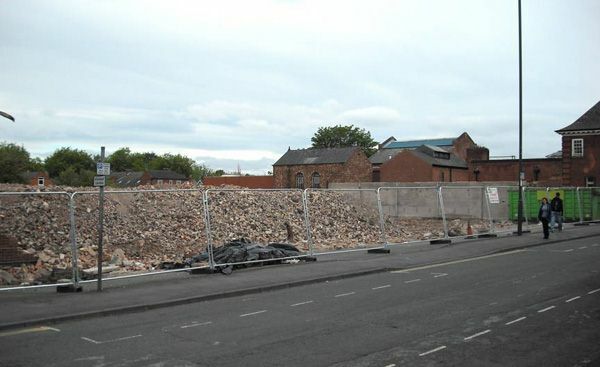 The industrial units on both Prospect Place and the one on Willoughby Street were demolished in 2011 having been unoccupied for quite some time. 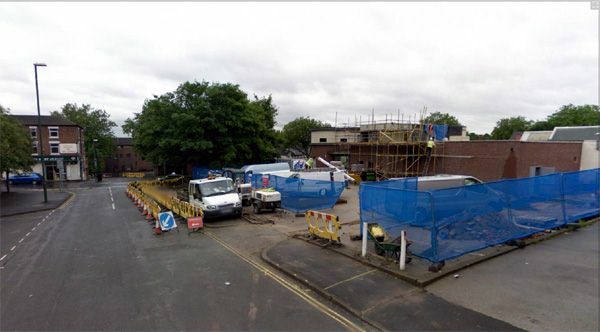 The Lenton centre just creeps into the picture on the extreme right of the photograph which was taken by Kevin Chamberlain. Another view from Willoughby Street of the demolition site. 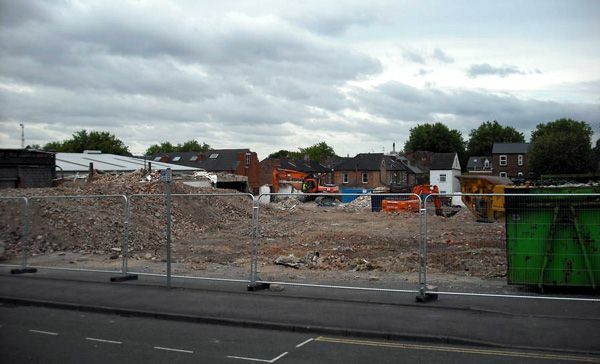 At the time of writing [May 2011] the vacant site has yet to be sold off and no potential developers are waiting in the wings. The junction of Willoughby Street and Park Road and Sherwin Road in late 2008. Work is clearly underway to convert the Dog and Topper pub into a Tesco Express. On your Willoughby Street webpage there is mention of Mr Neal who operated a cycle and radio business from No.30 Willoughby Street and that he might earlier have used No.22 Willoughby Street. You thought the latter might have been a lock-up shop but I confidently state that it was a family home as well. My family came to live in that property from Yorkshire in late October of 1935 when I was nine years old. We alighted at the number 3 bus stop and walked up the street to our new home, which proved to be a double fronted shop with a lot of living rooms which was just as well as our family were then ten in number of various ages, down to a young lad of five years - my brother Jack. We lived in this house for quite some time until Mum was to learn that the house next door No. 20 was empty so we moved there. Later No.3, a grocers shop, became vacant and we went there instead. Some time later Mum heard that the top house in the street, No.1, was for rent so we moved there. So you see I lived in the area for a long time getting to know many friends and neighbours. My dealings with Neal's came after a period of delivering newspapers for the local newsagent on Willoughby Street, a Mr Tom Elliot ( brother-in-law ) to Billy Hill (news and tobacco) who had the shop on Willoughby Street at the Derby Road corner. I was paid from my paper round 4 shillings and 6 pence per week and I gradually saved this money, week by week, until I had enough to purchase a brand new Raleigh Roadster at the cost of £4 16s. 4d. from Neal's, which I rode around the streets of Lenton for years. I was also a member of the local Boy's Brigade (11th Company) which met in the hall at the corner of Church Street and Willoughby Street, where we played snooker on an half-full size table on weekday evenings also table tennis and darts. Football was another of the sports we took part in. All sessions were overseen by one of our Officers of the Boy's Brigade of which Major Woodward was commander and Mr Hancock the Captain. 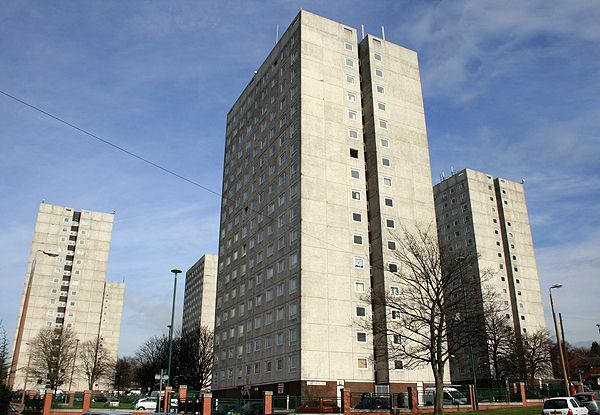 Many other memories of our days in Lenton remain with me. I lived at 8 Albion Terrace and 128 Willoughby Street between 1958 & 1968. I went to Cottesmore School and worked part time at Mervills the butchers before leaving school at 15 years old. Then I started work at Froggatt's Garage which led to a career in the motor trade. Tony Smith, who lived at the Albion Inn before the Selbys had the pub, and myself were keen motor cyclists. I had AJS model 30 600 twin. Tony had a Norton model 99 600 twin. We both turned these into cafe racers. We were the first motor cyclists to frequent the White Hart pub on Abbey Bridge which started the cult of bikers meeting there. My brother, Peter, was also a keen biker and he attended the gatherings at the White Hart some years later. I would really love to hear from anyone in that era who remembers me. My family moved to 73 Willoughby Street in 1955 when I was four years old and we lived there until 1962. During that time I attended Lenton Infants and Junior Schools and also went to Cottesmore School for a short while. I lived there with my parents Emily and Cyril Holmes, and my sister, Avril and brother, Alan. Our parents initially ran a motor spares business from No.73 but later converted it into an antique shop. Aileen has listed some of the fellow residents of Willoughby Street that she can remember and using Kelly’s 1956 Nottingham directory and electoral registers from 1956 and 1961 we have added some additional information. Majorie Hart [Cyril Hart – No.1], Betty Dilly [? ], a beer-off [Mitchells & Butlers Ltd. brewers (retail depart.) – No.15] - crossing Head Street - Shelbourn’s corner shop [ Lillian M. Shelbourn – No.47], Millie Bott’s [Thomas Farrell & Millie Farell (née Bott) – No.49], a pub [Smith’s Arm’s P.H. – No.53], Minnitt’s chip shop [Wm. A. Minnitt fried fish dealer - No.55], Considine’s [John Considine – No.57], Merchant [Reginald Norman Merchant – No.59], David Lamb [John H. & Joan Lamb – No.61a], Beard [Ronald S. & Blanche B. Beard – No.61], Panter (café) [possibly No.69 Mrs Joan M. Martin café], Mooney [? ], Miller (wool shop) [? ], our shop [Cyril & Emily Holmes – No 73], Addison’s butchers [William & Marie Addison – 73a], Gardie’s grocers [Bernard & Marion Gardie – No.77], Dyer (sweets) [Eliza Ann Dyer - No.79], Wilson’s (chemists) [T. Wilson chemist – No.81] – crossing Digby Street – Potts Infant’s Friend (corner of the street) [Potts Infant’s Friend manufacturing chemists Standard House Digby St.], Broughton’s paper shop [Wm. Hy. Broughton newsagents – No.83b (1953 directory)], Jack Feast [John L. & Annie Feast – No.95]. Billy Hill’s (paper shop) [Billy Hill – No.227 Derby Road] – crossing Manfull Street – Moult (cakes) [? ], Mason [? ], Nutty [Henry H. & Maud A. Nutty – No.80 1956], Frank Parkes (cobbler) [Frances & Lily Parkes – No.96], dairy [? ], wet fish shop [Lenton Fisheries (fishmongers) – No.60a], Mervill’s meat shop [Geo. 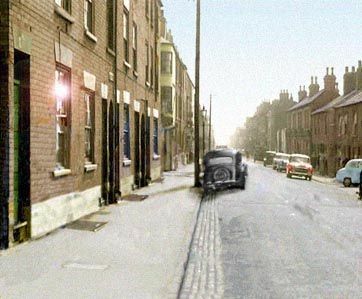 Herbert Mervill (pork butchers) – No.64], Monty Hind Boys’ Club [No.66] –crossing Church Street – hardware shop on corner [Stanley Ward, hardware dealer – No.68], Selby’s [J. & R. Selby, motor engineers – No.90], Taylor [Lawrence S. & Elizabeth Taylor – No.112]. 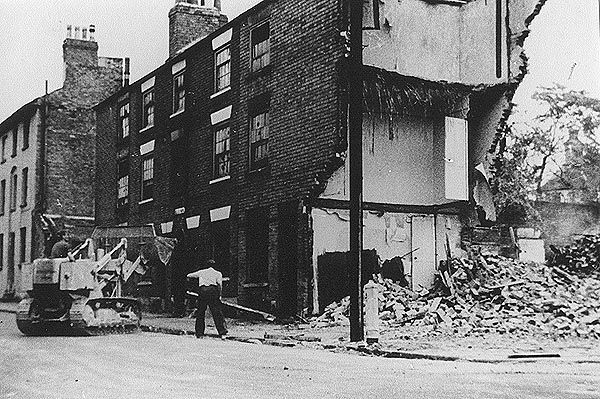 For about ten years I lived on Newgate Street and my family remained there until the demolition of the area began and we moved to Bestwood Park. 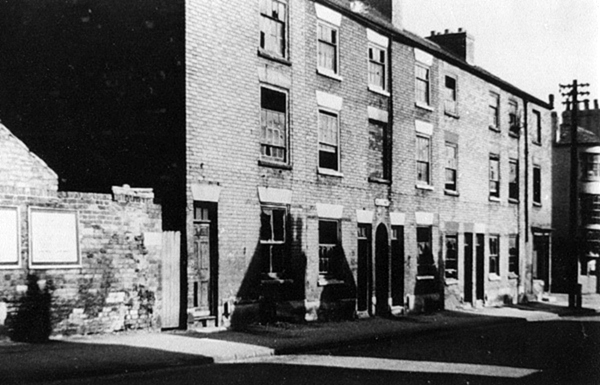 Newgate Street was the first street crossing Willoughby Street as you came along it from Derby Road. I remember the chip shop next to the Nags Head, where a hearty family meal of faggots and chips and gravy was to be had for about one shilling and sixpence. At the top of Newgate Street was a plumbers yard, and I recall one year when, during a thunderstorm, a fireball came down the street and took the paint off cars and house windows alike. The beer-off on the corner was run by Jack Hoult, who was very generous to us when we were down and out, which was often. Round the corner on Willoughby Street before the pub [the Nag's Head] was Mason's grocery store. Our entire block was, I believe, owned by Mitchells and Butlers, the brewery. 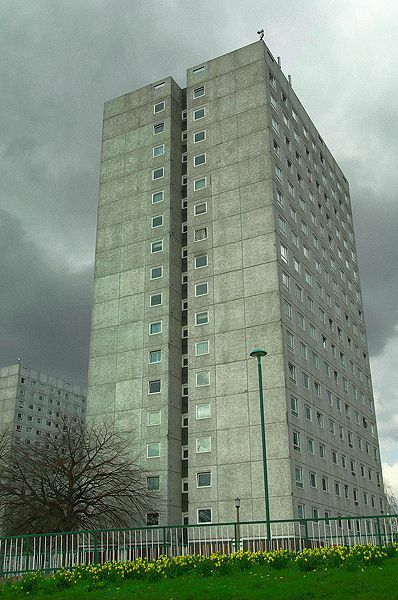 I have vivid memories of Lenton, as I was a paper lad for several years, traipsing from half way up Derby Road, all along Willoughby Street, down to Castle Boulevard and back through Abbey Street to Lenton Boulevard. I saved up enough to buy my first bicycle from the bike shop at the bottom of Willoughby Street. Our first car was a 1939 Morris Series E, bought from a man who owned an electrical shop on Willoughby St, and he must have had money because he ran a Ford V8 Pilot! back on Newgate Street we used to have our own bonfire on the 5th of November, which usually resulted in a few cracked windows and a big hole in the road. In the run up to Bonfire Night our pockets would be full of the thruppeny bangers which we bought from 'Lockies'. I was born at No. 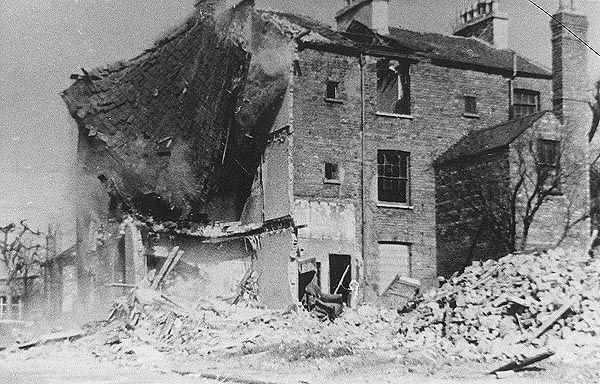 1 Albion Place in 1940. My parents were Arthur and Louisa Stables and we continued to live there until 1953. 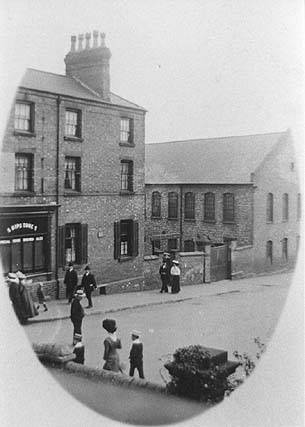 Albion Place was the name given to a terrace of five houses situated in a yard off Willoughby Street and just behind the Albion Inn on Sherwin Road. The properties on Albion Place were effectively one room deep. On the ground floor was our living room, above it my parents’ bedroom and on the top floor the bedroom I shared with my brother, John. The staircase leading up these was very steep and we always had to be careful. We had a scullery off the living room and a very small yard at the back with a gate which led on to Albion Terrace. My brother and I could regularly be found playing on the ‘Prom’, the strip of land between Sherwin Road and Castle Boulevard. When not on the Prom we might be found playing on Abbey Bridge banks or perhaps further afield off down Trent Lane. Once I was old enough, I was employed by Harry Wells as a paperboy. He had a newspaper business on Willoughby Street and gave me a round that took in most of Dunkirk so I had the use of the shop bike. This meant an early rise to deliver the morning papers and I was back there after school to do the evening papers not to mention the same round on a Sunday. For this I would be rewarded with the sum of 8s 6d. – I thought I was rich! Mr Turton who lived in house on Willoughby Street which backed on to Albion Place ran a greengrocery business from his front room. He also had a pony and cart which he used to go around the streets selling his wares. His pony was named Nelly and on Sundays his boys, Alan, Maurice and John would put Nelly in the trap and take us for rides around the countryside. Riding out in this cart remains one of my most vivid memories from this era. My uncle and aunt, Charles and Rose, used to have the chip shop on Grove Road across from the Grove Hotel. Also on Grove Road at No.23 was Alf Hornby, the coal merchant. His son, also called Alf, married my aunt Rose Scarlett. I also had an uncle Lawrence (Lal), who lived on Hungerton Street and an uncle Frank, who lived on Harley Street. In 1953 my mother gave birth to my sister Pamela and this prompted our move away from Lenton. No. 1 Albion Place was now thought too small for our family and the Council offered my parents a new house on the Clifton Estate. We moved in over the Easter weekend and gradually lost touch with our old neighbours. I do know that the Martin family, who lived at No. 3 later moved to a house on Castle Boulevard but I have no idea what happened to the others. My father was Nathaniel Arnold who was killed in the Second World War. His name has been included on your list of Lenton people who died in that war. It is good to know that he will not be forgotten. Nathaniel had married Nora Tunicliffe and they subsequently had my sister, Jill, and myself. His brother Lou had married my mother’s sister, Dora - while another brother, Bert Arnold, married Alice, another of my mother’s sisters. Three brothers marrying three sisters was very unusual and I understand that an article on them appeared in the local paper – possibly the Nottingham Evening Post. Dora and Lou Arnold, my aunt and uncle, lived with their son, Mick, on Willoughby Street. My Grandma Tunicliffe also lived there. Alice and Bert Arnold, along with their children, Susan and David, lived on Lombard Street. They later moved to Park Street where my Grandma Arnold lived. After my father’s death my mother married Jack Shaw and they had two sons, John and Martin. Our new father was a wonderful man and we couldn't have asked for better. We lived on Church Street. The property was situated in a yard with houses on three sides with a row of toilets making up the fourth side. Each toilet was shared by two houses. I remember on washdays my mother used the facilities at Lenton washhouse – washing was still hard work in those days. Among the other people I recall are Les Betts, his wife and daughter, Jean, who had a fresh fish shop on one side of Willoughby street & a greengrocers on the other. 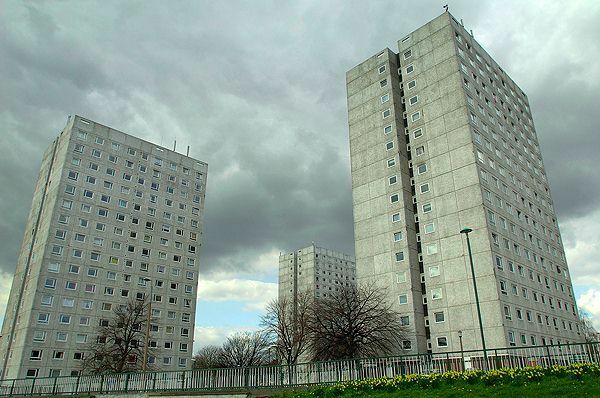 Their properties were just a couple of shops away from Monty Hind boys club and as a child I would sit on my window sill and watch them play. There was also Mr & Mrs Tom Adams, who had a grocers shop on the corner of Lombard & Church Street. They would sometimes give us the odd sweet while they were on ration. Otherwise, we only got sweets once a month. The Adams eventually sold the shop and moved to 29 Church Street about 1949/50. My family lived at 31 Willoughby Street, which was next door to The Nag's Head public house. Following Forest's victory in the 1959 Cup final we all stood on Derby Road to watch the team pass by with the cup on display. I can also remember 'Saturday Night and Sunday Morning' being filmed at the top end of Willoughby Street - I got a signed photograph off one of the actors. Once they started to demolish the Willoughby Street properties I seem to recall that the whole area became plagued with mice and rats. I was only seven when we finally left in 1961 to move to Clifton. Does anyone reading this remember my family - my parents were Bill and Dorothy Dennis? Len Taylor recalls the Willoughby Street area of his childhood. Do you have any historical information or other photographs of this area? If so, email us with the details or write to us.